Congratulations to Koko! We recognize and thank you for your many, many years of selfless work for the API LGBTQ communities. Koko was born in Taiwan and came to the United States when she was 16. As the oldest of 6 children, she was responsible for her siblings throughout their school years. She graduated from UC Berkeley with a Bachelors in computer science and began her career as a software engineer. Along the way, Koko became progressively more and more involved with the API and LGBT community, first volunteering with API-PFLAG, API Wellness Center, Asian Pacific Sisters (APS), Self Help for the Elderly and the Asian Women’s Shelter as well as APLBN (Asian Pacific Lesbian Bisexual Network). 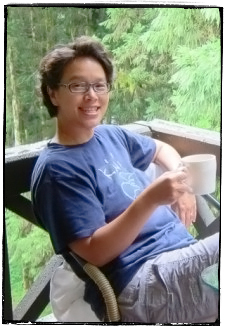 In 1993, she co-founded MAPLBN (Mandarin speaking Asian Pacific Lesbian Bisexual Network) which created the “Beloved Daughter” booklet, a collection of letters from parents about their gay children. Translated into both Chinese and English, Koko helped to distribute it to China, Taiwan, and Southeast Asia, as well as to many individuals, libraries, schools and Chinese communities in the U.S.
She helped plan the APLBN conference at UCLA (1998), the first Tongzhi Conference in San Francisco (2000), and APIQWTC’s conference in Oakland. She also co-founded the very first Asian co-gender LGBTQ dance club “Jaded” (1995-1998). Koko was one of the co-founders of APIQWTC in 1998, but it all began when she helped to organize the annual APLBN (now APIQWTC) annual banquet more than 20 years ago. Other events include organizing the gay contingent for the Chinese New Year parade, Rice Bowl, summer BBQ, and API contingent for the Pride Parade and Dyke March. Later, she became a board member of Purple Moon and API Family Pride. She continues to be active with APIQWTC, where she LOVES helping with the annual banquet. Every October, she also participates in “Swim-a-Mile for Women with Cancer”, that is sponsored by the Women’s Cancer Resource Center in Oakland. She is also a co-founder of the Red Envelope Giving Circle (REGC), which is committed to creating positive social change through philanthropic support to Asian and Pacific Islander LGBTQ-led projects that improve the lives of API LGBTQ people and communities. She has received multiple awards for her community service; the George Choy award from GAPA in 1999, the Luminary award from the Purple Moon Dance Project in 2012, and the East Bay Stonewall Democratic Club Trailblazer award in 2013. When she has any leisure time, Koko loves to oil paint, play tennis and golf, and continue to build a better community for LGBT people. Occasionally, she even develops software for her clients. APIQWTC was formed in 1999 and as a legacy from previous APIQW organizations has continued celebrating the lunar new year with an annual banquet tradition. In 2012 we celebrate our communities’ 25th Banquet year. Proceeds of the Banquet aid projects that support and promote the visibility of the API LBTQ community. Your support also funds other APIQWTC activities, such as the summer BBQ, Pride, and other events. Every year, APIQWTC presents the Phoenix Award to someone for their lifetime achievements and contributions to the API queer and transgender community. It’s our way of recognizing our many members who have done so much for our community in countless ways. Come celebrate with us at our 2014 Spring Lunar New Year Banquet! An awesome lineup of entertainment and community spirit awaits you! Registration details at http://www.apiqwtc.org/banquet/banquet-information/.